I have not blogged in a while, so let me try and at least capture some of what we did at the summit and academy. 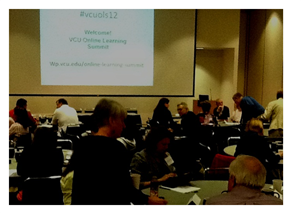 The online learning summit Monday was a first for the faculty of VCU and our CTE. In some ways, it started as a trip down memory lane. Bill Pelz of Herkimer County Community College and the SUNY Learning Network was our keynote presenter. I had the pleasure of working with Bill at HCCC, and was there as he started Herkimer on its online journey. 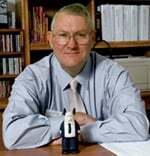 In fact, we were recalling that he, I and Ron Carvin gave a presentation to SUNY chairs back in 1998 on this new thing called online learning! Bill gave the keynote, and he was followed by seven VCU faculty presenting papers. I have linked to the papers below. The summit was conducted in a room with multiple round tables, and following each set of presentations, the presenters moderated the table discussions to capture faculty perceptions about shifts in teaching practice. Bill set the stage with his discussion of “technoheutagogy” – a term most had not heard (since Bill created the term) but a term that captured in part the evolution of learning online. Bill took us on a historical look at first pedagogy (how children learn), then andragogy (how adults learn), followed by heutagogy (self-determined learning). 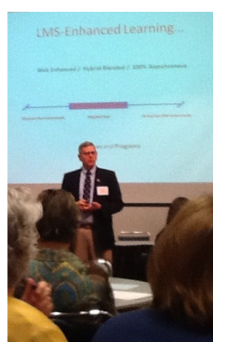 Bill added the “techno” prefix to move self-determined learning online. We really wanted this summit to be a chance for dialogue rather than passive reception of talks. Following these presentations, we discussed the talks at our tables and collected ideas on what shifts in practice seem most important, how are instructor roles changing, and how does teaching online shape expectations about faculty load. We also brainstormed support that faculty felt they needed in order to more effectively teach online. We again did small group discussions around effective teaching practices as demonstrated by these papers. Our plan is to collect these table discussions with the papers and publish a conference proceedings from the day. All the papers contained valuable and relevant information, and I would recommend your review of them. We spent Tuesday completing our plans for next week, and then hit the road Wednesday morning for UMW and Faculty Academy. We could only attend one day, but as always, Mary Washington’s Faculty Academy inspires us. Martha Burtis was unfortunately out sick, but Jim Groom, Steve Greenlaw, Tim Owens, Alan Levine and others welcomed those of us from off campus and provided a rich selection of presentations to move our thinking. Giulia Forsythe let us use multiple markers as we played with visual notetaking. 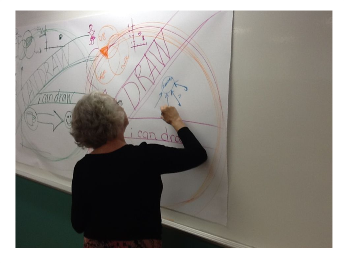 While she had each of note “I can draw!” on our charts, Joyce’s looked a lot better than mine! Jason Davidson, Mike McCarthy and former student Shannon Hauser showed different uses of the UMW WordPress blogs in their teaching and learning. I was particularly blown away by Shannon’s rich uses of blogs both personally and professionally. Grant Potter gave a great plenary on “Tinkering, Learning, and the Adjacent Possible”. His main point was that creativity and innovation do not often happen in structured spaces (physical or virtual), but rather need open, transparent, and chaotic processes that allow recombinations / remixing of ideas. Lots to think about from these past few days…and lots to look forward to in the next two weeks!